A lally column can be made from wood, steel, concrete or concrete block. It's a vertical structural member that supports a horizontal beam. Steel and wood must be protected from fire damage. A lally column is a standard structural member found in just about every building. The lally column supports a lot of weight. It's important to realize a concrete footing under the concrete slab distributes the concentrated weight. A concrete floor is often poured on top of the concrete footing and the lally column might sit on the floor. 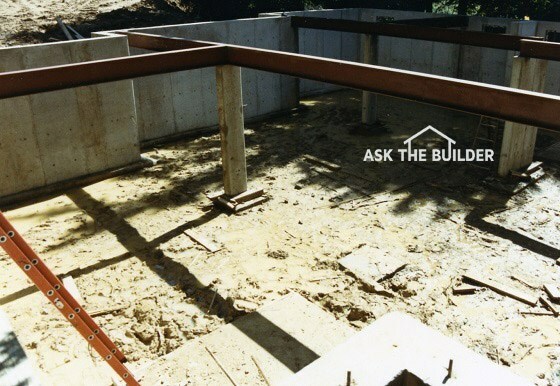 A point often overlooked is hollow steel columns must be filled with sand so they don't bend and fail in a house or building fire. A hollow steel column will bend like soft taffy candy in a hot fire. CLICK HERE to get FREE & FAST BIDS from local steel fabricators who make & install great columns. Concentrated loads may start up high in a building. Solid blocking or support must be under these loads from high up in the building until they pass through the lally column and down to the earth under the footing. You can see an example of this in the video above. At the top of the column is the structural header, but above that is a block of wood that touches the underneath of the subfloor. The reason that is important is once the house is built upstairs, there will be a post sitting on top of this block and lally column. This upper post will be supporting weight from the roof. The upper post can't just sit on the subfloor. It would be too much weight for the floor. Direct load bearing all the way down to the ground below. You can see how that happens with the wood column above, solid subflooring, the support block above the support header, then the header and finally on to the lally column. You have to be sure your bearing points are all properly supported all the way down.